ജർമ്മൻ ചിത്രകാരനായിരുന്നു ഹാൻസ് ഹോൾബീൻ (ദ യങ്ങർ)(1497– 1543).ചിത്രമെഴുത്തു ഹോൾബീൻ അഭ്യസിച്ചതു പിതാവായ ഹാൻസ് ഹോൾബീൻ രണ്ടാമനിൽ നിന്നായിരുന്നു. പണ്ഡിതനായ എറാസ്മസിന്റെ ലേഖനങ്ങൾക്ക് ചിത്രം വരച്ചുകൊണ്ടാണ് ഹോൾബീൻ പ്രശസ്തനായത്. ബേസലിൽ താമസിയ്ക്കുന്ന കാലത്തു വരച്ച പരേതൻ ആണ് അദ്ദേഹത്തിന്റെ ഉത്തമ കലാസൃഷ്ടിയായി വിലയിരുത്തപ്പെടുന്നത്. യൂറോപ്പിനെ ഗ്രസിച്ച പ്ലേഗ് മഹാമാരിയെ പ്രതിപാദ്യമാക്കി വരച്ച മരണനൃത്തവും ഏറെ ശ്രദ്ധിയ്ക്കപ്പെട്ടു. ഇംഗ്ലണ്ടിലെ പല പ്രമുഖരുടേയും ഛായാചിത്രകാരനായി പേരെടുത്ത ഹോൾബീന്റെ ചിത്രങ്ങൾ വിൻസർ കൊട്ടാരത്തിൽ സൂക്ഷിച്ചിരിയ്ക്കുന്നു. Portrait of Bonifacius Amerbach, 1519. Oil and tempera on pine, Kunstmuseum Basel. The Body of the Dead Christ in the Tomb, and a detail, 1521–22. Oil and tempera on limewood, Kunstmuseum Basel. Portrait of a Lady with a Squirrel and a Starling, c. 1527–28. Oil and tempera on oak, National Gallery, London. Noli me tangere, possibly 1524–26. Oil and tempera on oak, Royal Collection. Portrait of Jane Seymour, c. 1537. Oil and tempera on oak, Kunsthistorisches Museum, Vienna. Henry VIII and Henry VII, part of cartoon for wall-painting at Whitehall, 1537. Pen in black, with grey, brown, black, and red wash on paper mounted on canvas, National Portrait Gallery, London. Portrait of Christina of Denmark, c. 1538. Oil and tempera on oak, National Gallery, London. Portrait of Anne of Cleves, c. 1539. Oil and tempera on parchment mounted on canvas, Louvre, Paris. Henry Brandon, 2nd Duke of Suffolk, portrait miniature, 1541. Watercolour on vellum, Royal Collection, Windsor Castle. Ackroyd, Peter. The Life of Thomas More. London: Chatto & Windus, 1998. ISBN 1-85619-711-5. Auerbach, Erna. Tudor Artists: A Study of Painters in the Royal Service and of Portraiture on Illuminated Documents from the Accession of Henry VIII to the Death of Elizabeth I. London: Athlone Press, 1954. OCLC 1293216. Bätschmann, Oskar, & Pascal Griener. Hans Holbein. London: Reaktion Books, 1997. ISBN 1-86189-040-0. Beyer, Andreas. "The London Interlude: 1526–1528." In Hans Holbein the Younger: The Basel Years, 1515–1532, Müller, et al., 66–71. Munich: Prestel, 2006. ISBN 3-7913-3580-4. Borchert, Till-Holger. "Hans Holbein and the Literary Art Criticism of the German Romantics." In Hans Holbein: Paintings, Prints, and Reception, edited by Mark Roskill & John Oliver Hand, 187–209. Washington: National Gallery of Art, 2001. ISBN 0-300-09044-7. Brooke, Xanthe, and David Crombie. Henry VIII Revealed: Holbein's Portrait and its Legacy. London: Paul Holberton, 2003. ISBN 1-903470-09-9. Buck, Stephanie. 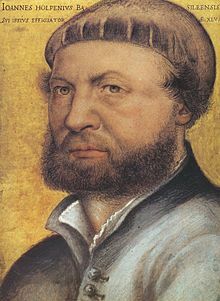 Hans Holbein, Cologne: Könemann, 1999, ISBN 3-8290-2583-1. Calderwood, Mark. "The Holbein Codes: An Analysis of Hans Holbein’s The Ambassadors ". Newcastle (Au): University of Newcastle, 2005. Retrieved 29 November 2008. Claussen, Peter. "Holbein's Career between City and Court." In Hans Holbein the Younger: The Basel Years, 1515–1532, Müller, et al., 46–57. Munich: Prestel, 2006. ISBN 3-7913-3580-4. Foister, Susan. Holbein in England. London: Tate: 2006. ISBN 1-85437-645-4. Foister, Susan; Ashok Roy; & Martyn Wyld. Making & Meaning: Holbein's Ambassadors. London: National Gallery Publications, 1997. ISBN 1-85709-173-6. Ganz, Paul. The Paintings of Hans Holbein: First Complete Edition. London: Phaidon, 1956. OCLC 2105129. Gaunt, William. Court Painting in England from Tudor to Victorian Times. London: Constable, 1980. ISBN 0-09-461870-4. Hearn, Karen. Dynasties: Painting in Tudor and Jacobean England, 1530–1630. London: Tate Publishing, 1995. ISBN 1-85437-157-6. Ives, Eric. The Life and Death of Anne Boleyn. Oxford: Blackwell, 2005. ISBN 978-1-4051-3463-7. King, David J. "Who was Holbein's lady with a squirrel and a starling?". Apollo 159, 507, May 2004: 165–75. Rpt. on bnet.com. Retrieved 27 November 2008. Landau, David, & Peter Parshall, The Renaissance Print, New Haven (CT): Yale, 1996, ISBN 0-300-06883-2. Michael, Erika. "The Legacy of Holbein's Gedankenreichtum." In Hans Holbein: Paintings, Prints, and Reception, edited by Mark Roskill & John Oliver Hand, 227–46. Washington: National Gallery of Art, 2001. ISBN 0-300-09044-7. Müller, Christian; Stephan Kemperdick; Maryan W. Ainsworth; et al.. Hans Holbein the Younger: The Basel Years, 1515–1532. Munich: Prestel, 2006. ISBN 3-7913-3580-4. North, John. The Ambassadors' Secret: Holbein and the World of the Renaissance. London: Phoenix, 2004. ISBN 1-84212-661-X. Parker, K. T. The Drawings of Hans Holbein at Windsor Castle. Oxford: Phaidon, 1945. OCLC 822974. Reynolds, Graham. English Portrait Miniatures. Cambridge: Cambridge University Press, 1988. ISBN 0-521-33920-0. Roberts, Jane, Holbein and the Court of Henry VIII, National Gallery of Scotland, (1993). ISBN 0-903598-33-7. Roskill, Mark, & John Oliver Hand (eds). Hans Holbein: Paintings, Prints, and Reception. Washington: National Gallery of Art, 2001. ISBN 0-300-09044-7. Rowlands, John. Holbein: The Paintings of Hans Holbein the Younger. Boston: David R. Godine, 1985. ISBN 0-87923-578-0. Sander, Jochen. "The Artistic Development of Hans Holbein the Younger as Panel Painter during his Basel Years." In Hans Holbein the Younger: The Basel Years, 1515–1532, Müller, et al., 14–19. Munich: Prestel, 2006. ISBN 3-7913-3580-4. Scarisbrick, J. J. Henry VIII. London: Penguin, 1968. ISBN 0-14-021318-X. Schofield, John. The Rise & Fall of Thomas Cromwell. Stroud (UK): The History Press, 2008. ISBN 978-0-7524-4604-2. Starkey, David. Six Wives: The Queens of Henry VIII. London: Vintage, 2004. ISBN 0-09-943724-4. Strong, Roy. Holbein: The Complete Paintings. London: Granada, 1980. ISBN 0-586-05144-9. Waterhouse, Ellis. Painting in Britain, 1530–1790. London: Penguin, 1978. ISBN 0-14-056101-3. Wilson, Derek. Hans Holbein: Portrait of an Unknown Man. London: Pimlico, Revised Edition, 2006. ISBN 978-1-84413-918-7. Zwingenberger, Jeanette. The Shadow of Death in the Work of Hans Holbein the Younger. London: Parkstone Press, 1999. ISBN 1-85995-492-8. Hervey, Mary F.S. Holbein's "Ambassadors": The Picture and the Men. An Historical Study. London, George Bell & Sons, 1900. O'Neill, J. The Renaissance in the North New York, The Metropolitan Museum of Art, 1987. Michael Servetus Research Website with a graphical study on the three biblical works by Servetus with woodcuts of Hans Holbein, Icones. A documentary video about Holbein's finest painting, The Ambassadors. ഈ താൾ അവസാനം തിരുത്തപ്പെട്ടത്: 13:45, 13 സെപ്റ്റംബർ 2018.